Nepal’s Prime Minister Khadga Prasad Oli has returned to Kathmandu after a three-day visit to India that lasted from April 6-8. It was his first foreign visit after being elected as the Prime Minister of Nepal for the second time. This visit was being carefully watched by all, as Prime Minister Oli is known to hold pro-China political views. India is increasingly worried over China’s growing influence in its neighbourhood. The countries did not reach any agreement, but the Oli visit produced some joint statements, particularly one to extend the rail link from Raxaul in India to Nepal’s capital Kathmandu, which India’s Prime Minister Narendra Modi floridly described as connecting Mount Everest with the sea; and another one to work for new connectivity between India and Nepal through inland waterways. India’s willingness to build a railway connection is particularly significant as China has already started working to extend its railway network to Nepal. However, as the joint statement does not mention any particular river or any specific water route for inland waterways, it is doubtful if India is really serious about the second proposal. The inland waterways plan, if it gets implemented, will not be free from controversies considering the troubled history of water relations between the two countries. Two water projects, which have made bilateral relations tense in recent months are the Budha Gandaki project – which Oli wants Chinese companies to build but India is opposed to it – and complications over delayed implementation of the proposed Pancheshwar Dam on the Mahakali River along the India Nepal border. The joint statements have avoided these two contentious issues. As it looks now, the future of the Budha Gandaki project is quite uncertain due to the ongoing China-India ‘Cold War’. After reaching Kathmandu, Prime Minister Oli addressed a press conference at the airport. He did not mention Budha Gandaki, but made it clear that he has taken up the matter regarding delayed implementation of Pancheshwar Dam project with India and has asked for an early start of its work. It is however not as easy for the Indian government to start the Pancheshwar Dam construction as Oli has hoped. Protests in Nepal against ‘Indian’ projects have recently delayed the construction of several planned Indian dams, including the Karnali Project (Chisapani Dam) and the Kosi high-dam project. The most controversial and complicated one is India’s planned water storage projects on the Mahakali River, particularly the Pancheshwar Dam. It is thus important to understand the complex and conflictual history of this project and the futility of the riparian countries hoping of an early completion of it. The origin of the Pancheshwar Dam trouble goes back to when India’s colonial rulers had signed the Sarada Treaty with Nepal in 1920. 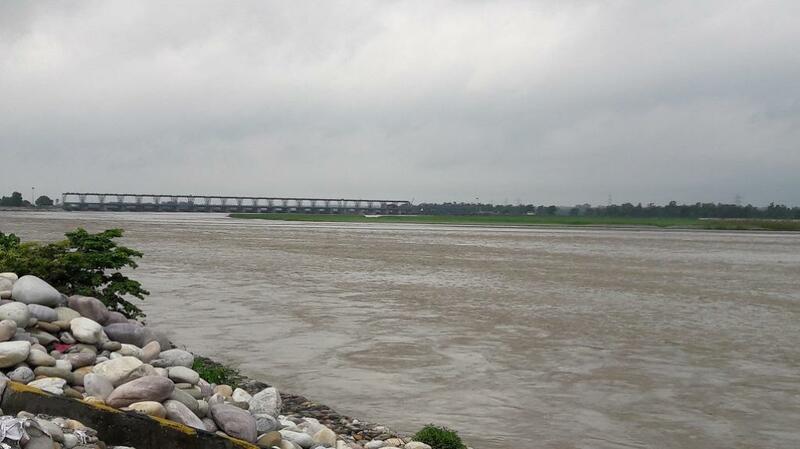 India constructed the Sarada barrage on Mahakali River after exchanging 4,000 acres of territory with Nepal. But Nepal became unhappy with its share of 400 cusecs of water allocated by the treaty. Moreover, the construction of the Sarada Barrage also brought difficulty for the implementation of Nepal’s own Mahakali Irrigation Project. Downstream of the Sarada Barrage, the Mahakali once again flows into Nepal, and then into India where it joins the Ghagra River. In 1983, India unilaterally started the construction of a 120-megawatt dam, called Tanakpur power project, in its own territory, which was completed in 1989. To increase the size of the pondage to ensure uninterrupted operation of the hydropower plant, India wanted the bund to be extended to the contiguous high ground in Nepal. In exchange of 2.9 hectares of land from Nepal, India agreed to provide to Nepal 150 cusecs of water and 10 megawatts of electricity from the Tanakpur project at no cost. In December 1991, the decision was formalised in a Memorandum of Understanding (MoU) between the two countries, which is commonly referred to as the Tanakpur Agreement. This Tanakpur Agreement became extremely controversial in Nepal, as it was framed in nationalist terms, by raising concern for Nepal’s territorial sovereignty. The opposition accused the government of ignoring Nepal’s interests to appease India. When India’s then Prime Minister P.V. Narasimha Rao visited Nepal in 1992, the Indian side made some concessions. The Pancheshwar project on the river and other possible interventions were separated from the understanding reached on Tanakpur, allowing both countries the possibility to negotiate for any other development in the Mahakali basin. India agreed to provide an additional 10 megawatts of electricity to Nepal, making a total of 20 megawatts. These Indian concessions were not enough to satisfy the public opposition against the project in Nepal. After a change of government in India, on February 12, 1996, the Prime Ministers of India and Nepal signed the Mahakali Treaty. The Treaty included three separate water development projects in its scope. In addition to endorsing the Tanakpur MoU of 1991, the Treaty took under its annex the regime established by the 1920 Sarada Treaty. It also included the planned construction of the Pancheshwar Hydropower Project on a stretch of the Mahakali between the two countries. This proposed 315-metre-high rock-fill dam, if built, is going to be the second highest in the world after the Rogun Dam in Ukraine. The reservoir of this dam is expected to store 12 billion cubic metre of water of the Mahakali River to supply 885 cumecs discharge below the power house, of which there will be 3,240 megawatts hydropower capacity on each side of the river. In Nepal, the reservoir is expected to flood 54 square kilometres of land and in India, it will inundate 80 square kilometres. The 1996 Treaty is based on the principle that, as a boundary river, the Mahakali will be developed in an integrated way to maximise the total net benefit from development. The Treaty has also the provisions for the establishment of the Mahakali River Commission with its relatively broad mandate. In spite of having some of these progressive provisions, the construction of the Pancheshwar Dam has not started yet as it continues to be a politically volatile issue. Nepal had prepared a detailed project report in 1995, but India took till 2003 to prepare its report. At the time of signing the treaty, it was estimated that the installed hydropower capacity of the project would be 6,480 megawatts, but the latest estimate suggests it will be only of 4,800 MW. Moreover, the water demand in the two countries is much higher than the proposed project’s augmentation plan. The countries also disagree over the sharing of the capital cost and even had to revise the original plan about the location of re-regulating the Rupaligad Dam downstream of the Pancheshwar Dam site. Not only that, while India proposes phasing the power component in two stages for an assured supply of water to its Girjapur barrage downstream, Nepal prefers to maximise the power benefit. When Modi visited Nepal in August 2014, a new MoU was signed between the two countries regarding the amendment of Terms of Reference of the Pancheshwar Project. Immediately after that, in September 2014, the governing body of the Pancheshwar Development Authority met for the first time. Though Modi had assured Nepal to start construction of the project within one year, almost four years have passed but the project is yet to start, in spite of India’s increased interest in it in recent years. This dam is the key to the planned Sharda-Yamuna River link project to address Delhi’s growing water demand. The Modi government has given top priority to implement the country’s decades-old controversial plan of river linking. However, the construction of this mega-dam is not going to be as easy as Indian authorities are pretending. The dam project is expected to displace 19,700 people in the state of Uttarakhand and 11,466 people in Nepal. In June 2017, India’s Ministry of Environment, Forests and Climate Change had decided to approve the project without doing the usual joint environmental impact assessment with Nepal. After strong opposition from affected people and environmental groups, a public hearing process of expected dam affected people started in August 2017. Due to the region’s rich anti-dam protest movement experiences, those against the Pancheshwar Dam have already come out to protest, as should have been expected. Besides the displacement of a large population, the dam project is also being opposed due to its location in a highly ecologically sensitive and earthquake prone zone. The Pancheshwar Dam project and it being part of the three controversial projects under one agreement has all the ingredients to be highly controversial before and after its construction. The governments of India and Nepal seem to have failed to learn from their experiences that building large dams is not an easy proposition for them anymore. These dams are highly expensive and environmentally destructive. Moreover, both India and Nepal have strong history of anti-dam protests. Democratization in Nepal has given further strength to not only the country’s anti-dam activism but also to its anti-India political groups. It is high time India tries to make a new start in re-conceptualising its bilateral river water cooperation with Nepal. India should move beyond its old idea of big-dam centric water management of the shared rivers and try to actively explore cooperation over alternative smaller hydropower possibilities in Nepal. By forcing Nepal to make sacrifices for its mega dam projects, India has already ruined its relations with Nepal. Oli’s visit had offered an opportunity for India to start discussing a new start and think of alternative ideas, but unfortunately that has not been grabbed. It will be good for the both the countries to find new ways as soon as possible to move out of the conflict trap and start to build cooperation over their shared water resources. It has destroyed age old relationship with Nepal mainly due to bad structucture of South block officials.